As someone who seems to find themselves always 'up to something' at the moment, I often find it really hard to just chill out. I feel like my mind is constantly ticking over and thinking about what I need to get done and sometimes, that can get rather exhausting. Recently, I have taken a little step back from blogging and what not and it's been really nice to actually feel relaxed and rested, rather than feeling completely burnt out. 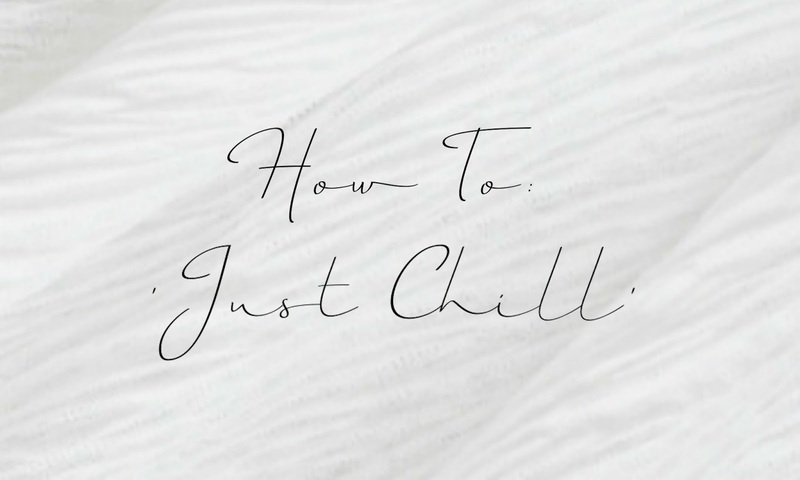 The first thing I had to do to chill out was simply, stop blogging for a little bit. Well, I say 'simply' but honestly it's such a hard thing to do. At the end of the day, my blog is my baby, my pride and joy and I love writing and photographing for it. However, I was beginning to feel like my posts were a little 'lack lustre' and had a little bit of writers block and felt kind of uninspired. Taking a little break from your blog can spark so many new ideas that you probably wouldn't have come up with just by staring at blogger on your laptop screen. Give your mind a rest! As a fashion blogger, sometimes you get sent pieces to style or you buy new bits and pieces to write about, but after a while I think you can begin to feel suffocated by clothes and well, that kind of made me feel like I'd lost my sense of style for a bit. I would look at my wardrobe and keep grabbing for the same pair of jeans, the same top and the same boots and well, the rest I just didn't need. I cleared my wardrobe out and created a capsule wardrobe for myself and honestly, I feel so much more at ease. I popped everything else on Depop (username - holrebeccawhite) and it was like this huge pile of clothes had been lifted from my shoulders haha. Online shopping is great too! It helps to inspire new outfit ideas and also to fill any gaps there might be in your wardrobe. After I cleared my wardrobe out, I realised that I could maybe do with a few more basic tops and jeans since that's basically my attire for just day-to-day and so, I began to search the internet to find the perfect pieces. Also, it's just sooooo therapeutic to scroll through clothing sites! This links in with the online shopping, but sometimes, you just need to treat yourself! Is there something that you've been eyeing up on Missguided for the past 4 weeks? Well, go buy it! Sometimes it's nice to reward yourself for all your hard work! This is a big one. Bloggers tend to spend a lot of time in their houses, unless we're out shooting outfits or at events and often it can make us become kind of recluses. Simply just walking to your local shop or even having a day at a friends house instead can help you feel more at ease and take your mind off the blogging for a bit. Also, fresh air just does you the world of good and helps to perk up your mood. Sometimes I'll just take myself for a little walk and just try and appreciate my surroundings and forget the internet world for a while. Recently, I've been here there and everywhere and I have to say it's done me soooo much good. I've travelled to new places all on my lonesome and it's given me such independence. I mean, obviously I'm not saying to get out of your house, you need to take a trip to London on your own, but I'm just using that as an example of how it has helped me! Writing your ideas down on paper and getting them out of your mish mashed head, helps to make things so much clearer. It is much easier to find a place to start when you've got it all written out in front of you. I like writing different lists and then trying to organise it all together once I've got it all out on paper. For example, I might make a list of events I'm going to, then a list of blog post ideas and then maybe a list of collaborations I'm doing. Then after that, it's much easier to think about dates and organise who, what, where, when, why and how! Tell me, what do you do to 'just chill'?